Pay Attention: You are Being Watched! It’s kind of creepy to think about, but you are being watched. And while many are in denial about this fact, it is true and we need to find a way to believe it, accept it, and act accordingly. To tell you what I mean, let me back up a few weeks. I had gotten on one of my famous, yet short-lived, health kicks and decided I would get back in shape. One of the ways that has worked the best for me is by doing the “Insanity” workout videos. They are a whooping, but I’ve not found anything that works better for me. On Tuesdays and Thursdays, I would come home for lunch to do the workout, and typically my family was there as well since my wife is off on those days. My five year old started watching me do my “workouts” and asked if he could join in. I told him he could do the exercises, but to be careful and not overdo it. That’s when I felt really old and out of shape. My five year old started in on these exercises and killed it. He was doing the jumping jacks, up/downs, pushups, and mountain climbers with ease while I was trying to save my breath to live another day. But I noticed something as he joined me in my workouts. Every time I stopped to take a break, he would do the same. This was especially the case as we both got more tired. And the thing was, I could have kept pushing, but I chose to stop. So, he did as well. This might be a simple observation, but it has stuck in my head. What I do, my kid does. When I get mad and yell, it tells him he is okay to do it as well. When I don’t eat healthy, he will go for the candy. When I watch too much TV, he will do the same. Its this really simple idea that so many adults need to understand. Our kids watch us, no matter the age. I still watch my parents and follow their lead as a 37-year-old. 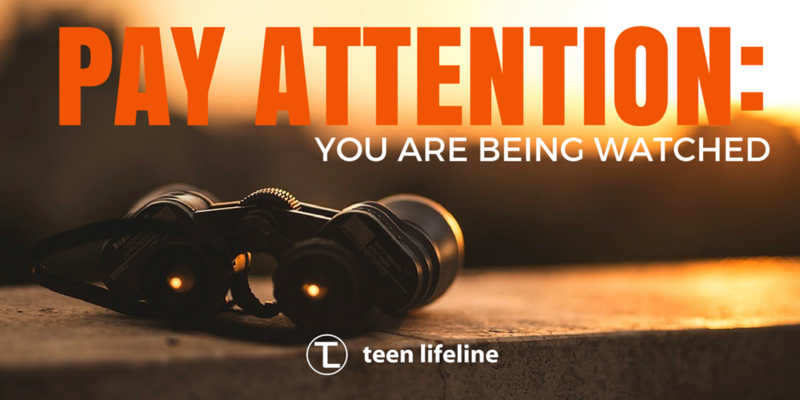 And if you have a teenager in your life, I assure you they are watching you and acting accordingly. The old line “do as I say, not as I do” is a load of garbage – and we know it. Those of us who work with teenagers or children need to understand our crucial role in leading and caring for the younger generation. To my adult friends who are reading this, take your role seriously. You are leading and influencing, even if you don’t think you are a leader or influencer. You can make more of a difference now by remembering who is watching you, and living up to that expectation. What do you think about this? How have you seen this reality play out in your relationships with teenagers?